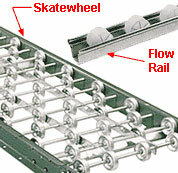 Steel rack framework supports skatewheel conveyor track levels for exceptional first-in first-out gravity flow carton feed. Load from the rear either through conveyor feed or forklift and pallet truck feed. Inserts into existing pallet racks. Choose fully configured 96" x 96" x 96" skatewheel flow racks with 3, 4 or 5 levels , or add flow levels to your pallet rack (24" to 144" wide; 60" to120" deep). Sturdy, no-lane flow storage for lean manufacturing. Applications: Skatewheel Flow Racks are ideal for work-in-process, assembly lines, warehouses, and other areas where dense flow storage of cartons, containers, and other bulk items is necessary. These are especially popular in the automotive manufacturing industry, and manufacturing in general.